Anyway, these salads aren't exactly the same as the Cafe Rio ones, mostly because of the time factor. All of the copycat recipes I've found involve a long marinating/cooking method for the chicken, and I was in the mood for a quick and easy dinner. I was surprised (and pleased) that even with using some quick shortcuts, my salad turned out awesome, and tasted almost the same as my beloved Cafe Rio salads. Since some people are apparently offended by posts with recipes for sandwiches and salads, I'll just list the things I added to my salad, and as always you can feel free to add what you like and skip what you don't. That's what's fun about a salad like this! 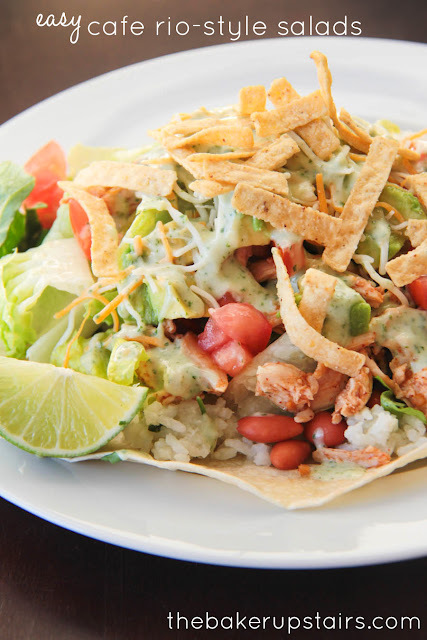 Here's what we added (in order from bottom to top): a freshly cooked flour tortilla, cilantro-lime rice, pinto beans (just drained and rinsed), chopped romaine lettuce, taco-seasoned chicken (shredded rotisserie chicken with taco seasoning), diced tomatoes, diced avocados, cheese, and crispy tortilla strips. And the best part of all? The dressing! This is officially my favorite salad dressing (which is surprising, considering all the cilantro!). I love that it's creamy and flavorful, with a little tanginess from the lime. I also love that it's so easy to make... just throw everything in the blender and it's ready in a few minutes! The original instructions say to refrigerate it for at least an hour, but I never do that and it's still great. This dressing pretty much just makes everything tasty! Try it today! Add all ingredients to a blender or food processor, and process until smooth. Add more milk if needed to reach desired consistency. If you know me very well, this recipe is probably a little surprising. I've made no secret of my contempt for cilantro, and I've left it out of countless recipes just for its ick factor. I ate just one little piece of it in a bowl of tortilla soup when I was pregnant with Abby and my morning sickness was at its peak, and... well, let's just say I'm going to avoid that restaurant for the rest of my days from the shame of it all. :) So anyway, fast forward to today, and cilantro and I have developed a grudging tolerance of each other. 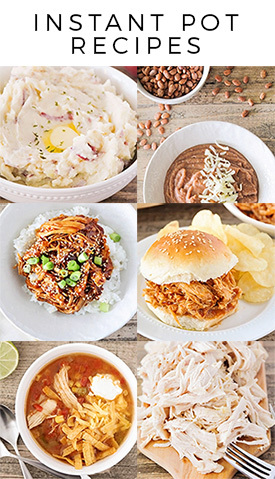 I'm not saying I'll ever love it, or throw it on top of my food just for funsies, but I can appreciate the flavor it adds to some of my favorite foods. Like this rice! This rice started out trying to be a Cafe Rio-type copycat, and ended up being more like Chipotle's cilantro-lime rice, which is awesome! I actually prefer the texture of Chipotle's rice and love the fact that it's a little more fluffy and sticky than the Cafe Rio rice. 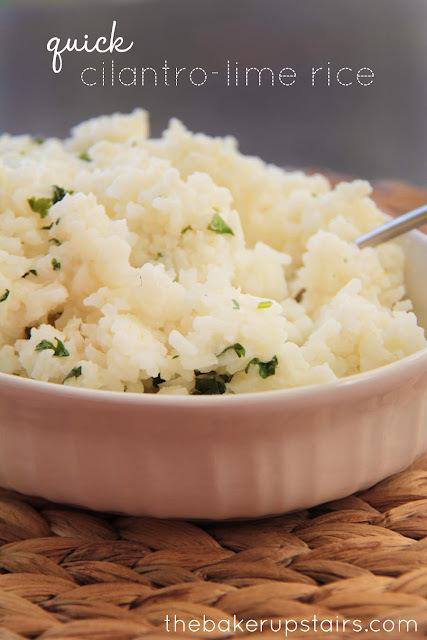 I also love that this rice is so simple and easy to make that it makes the perfect side dish for a weeknight dinner. 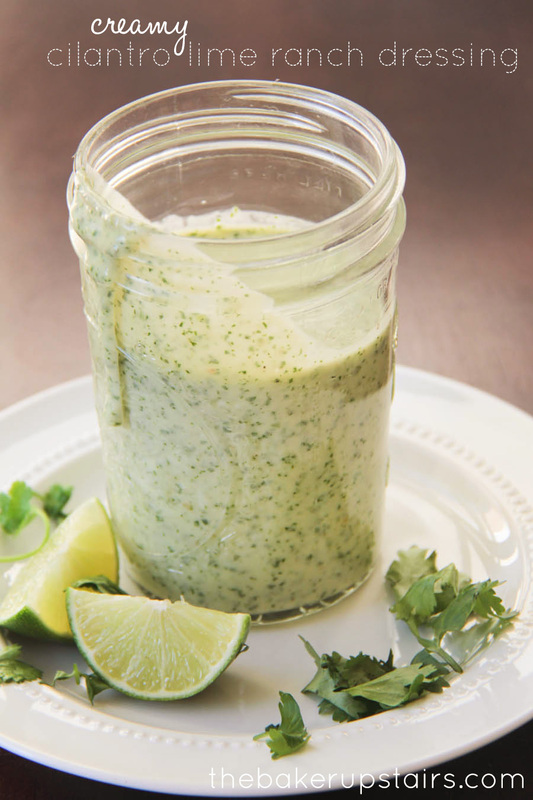 The lime and cilantro add flavor without being overpowering, and it's totally delicious. Yum! Comine rice and chicken broth in a small pot and bring to a boil. Reduce heat and simmer, covered, on low heat until rice is cooked, 15-20 minutes. Immediately stir in butter, cilantro, and lime juice, and mix well to combined. Fluff with a fork before serving. Enjoy! 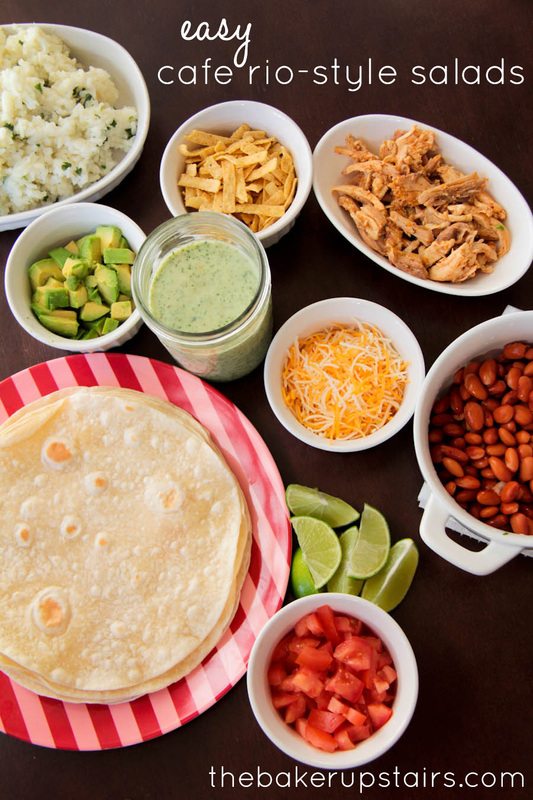 This is one of those making-it-up-as-I-go recipes that turned out super awesome! I had made some yummy Southwestern-ish food for dinner (coming later this week to the blog) and wanted a nice refreshing drink to go with it. This limeade was so quick to put together, and super delicious! Both of my littles loved it too. 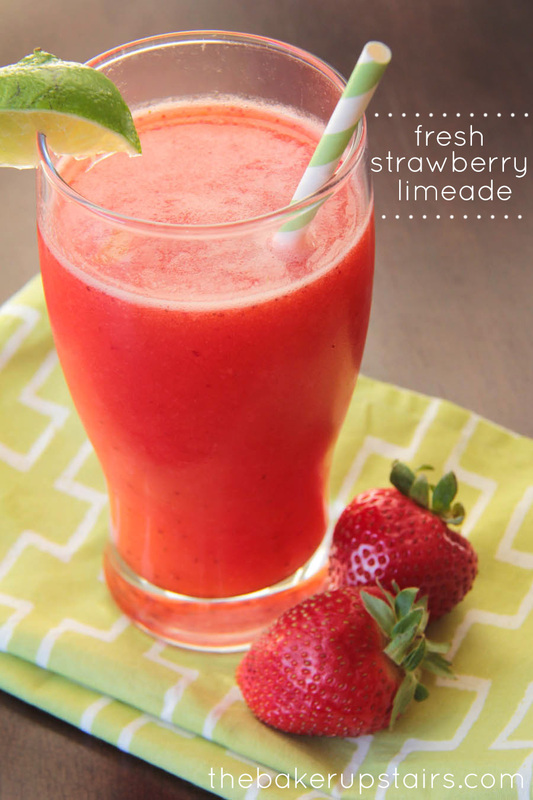 It's the perfect drink for any summer dinner! So... I have a funny story about pineapple upside down cake. My grandpa was born on June 9, and for my whole life up until he passed away when I was 18, we would go to my grandparents' house for his birthday, and my grandma would make two cakes: a german chocolate cake, and a pineapple upside down cake. It seemed to just be the natural order of things: grandpa's birthday = those two cakes. 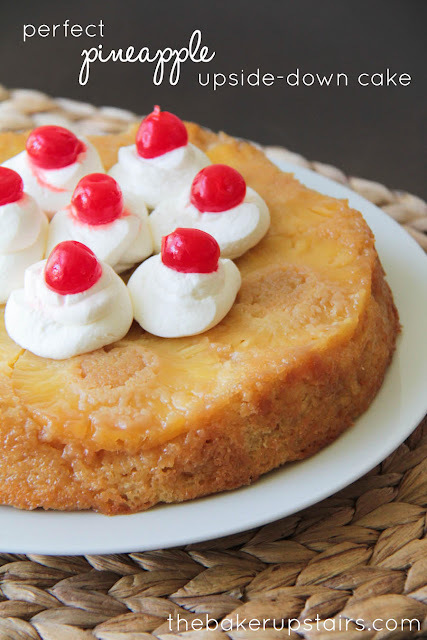 When I was a kid I hated coconut, so I always asked for a slice of the pineapple upside down cake, and savored every bite of it. Fast forward to when I got married, and I had the super great idea of collecting some of my favorite family recipes and making them into a cookbook. When I asked my grandma for her pineapple upside down cake recipe, she looked at me like I was crazy and said, "Um... can't you read a box?" Since then I've been on the lookout for an awesome homemade recipe that could match that wondrous taste from my childhood (that it turns out came from a box). And I finally found it! I love how moist and flavorful the cake is, and the juicy caramelized pineapple on top is pretty much just awesome. Add some whipped cream and a maraschino cherry or two, and it's pineapple upside-down perfection! Preheat the oven to 350. Grease 12 jumbo size muffin wells or two 8 or 9 inch cake pans. Whisk together the cake ingredients until well blended, and set aside. In a small bowl, mix together brown sugar and butter, making sure that no dry spots remain. Spoon mixture into muffin tins or cake pans, spreading evenly and being sure to distribute evenly. If using muffin tins, place one ring in each well; if using cake pans, arrange evenly in the bottom of each pan. Pour the cake mixture over the top. filling 3/4 of the way full. Bake 25 minutes for the muffin tins or 30-35 minutes for the cake pans, or until golden brown on top. Quickly after removing, run a knife around the edge of each cake to release it from the sides of the pan. Let cool for a few minutes, and then invert onto a plate or platter. Enjoy! 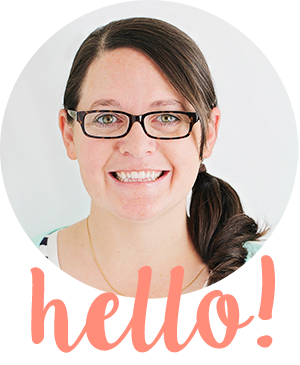 I'm so happy to be back posting on the blog this week! I really have missed my little blog space this last month or so. I'm still working on finding that balance between working full time, and being a great mom, but I'm finding more and more that I need to just make time for the things that matter to me. And those things include (of course) my husband and children, but also cooking and sharing recipes, and the fun that comes with all of that! Anyway, as you can imagine, it's a lot more of a struggle these days to cook dinner every night, but I'm giving it my best effort. 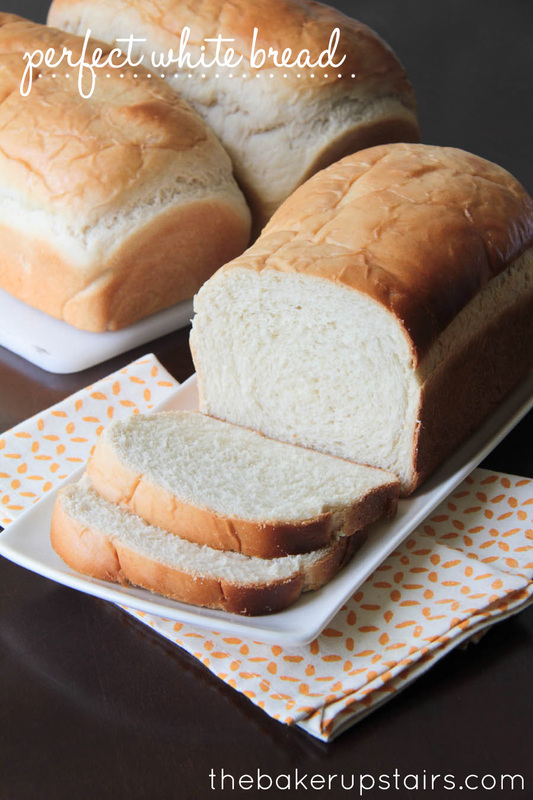 It helps when I stumble across quick and easy recipes like this one! It was a flavorful, delicious one pot meal, and took only about half an hour to put together. Win win! In a medium sauce pan, bring the chicken stock, water, and lemon pepper to a boil. 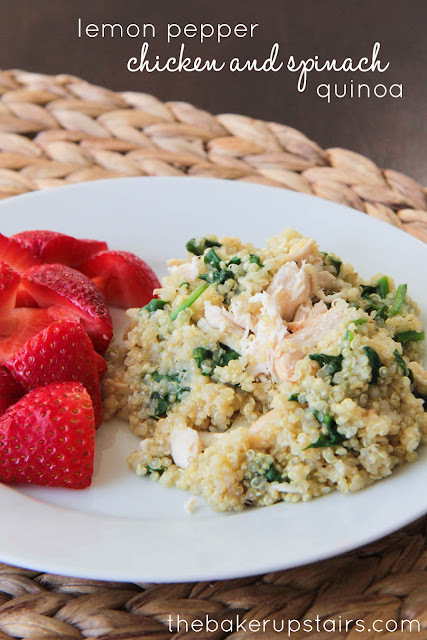 Stir in the quinoa, reduce the heat to medium-low, and simmer for 15 - 20 minutes, or until the quinoa is plump and tender. Gently add the spinach and shredded chicken, and stir until the spinach has wilted. Remove from heat and serve.